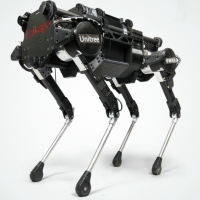 Laikago is a lightweight quadruped robot platform with twelve degrees of freedom. It can perform various forms of motion such as pitching，rolling，yawing and walking around. The mechanical structure is built by carbon fiber, which makes the robot lighter and faster. Laikago is easy to get start because it provides mathematical model, motor driver and software interface. By measuring the current of the motor, it is convenient to calculate the joint torque, which provides a prerequisite for the force control of the robot. Besides, IMU in Laikago provides Euler angles of the robot, thus it`s easy to measure the real-time state of Laikago. Moreover, we can add vision, laser radar, robotic arms and GPS to develop more applications. After installing battery on Laikago, press the power button and Laikago will get start. Laikago provides 2 types of API, High level API and Low lever API in High level API, users could control the whole robot by setting parameters such as velocity and Euler angle. The effectiveness of the robot motion algorithm is shown when setting the motion mode, angle of each motor in Low level API.